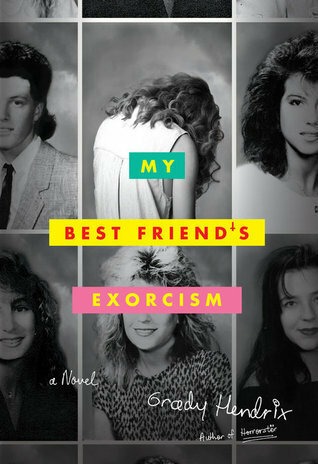 My Best Friend's Exorcism was probably one of the most entertaining books I've read this year. I started this book just a shy of a few days after Halloween. It is the perfect book to curl up to when you're in the mood for a little spooky fun! There were a few nights I would read this in bed, completely home alone and it was a little unnerving. Every little house creak and tick suddenly became a lot more noticeable! My Best Friend's Exorcism is a fun blast to the past. With it's 80's references and nostalgic song choices, this book will make you want to have the most epic E.T. Rollerskating party after you're done reading it! Grady Hendrix did an excellent job writing from the perspective of 2 female lead characters. He actually captured the awkward adolescence of teenage girls flawlessly. I related quite a bit to Abby and adored her character. The book is told from Abby's perspective and the chapters are laid out by awesome relative song choices. Trust me, you will have the most rockin' 80's playlist afterwards. This book will make you laugh, cry and give you nightmares. It is the perfect package: 2 best friends. 1 being overtaken by a demon and the other willing to die trying to save her. "Two people were fighting to be visible on Gretchen's face." "Hot damn!" he shouted. "We got ourselves a demon!" I was just talking about this book a few days ago!! I've been in the mood for horror and the book I just got done reading was one of those horror covers with NOT horror insides. But this one has 80's and that is just icing on the cake :) Glad you liked it.